I stock a huge range of body jewellery, and I am happy to order body jewellery items in any size/colour/style you would like, even if it isn’t part of my regular stock, just ask. I order once a month at the beginning of each month. I will fit any jewellery bought from me free of charge (£5 extra charge for stretching piercings – ages 18+). I also stock a range of merchandise – T- Shirts, Prints, Tote Bags, etc. and Gift Vouchers. 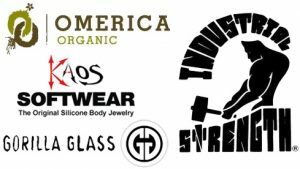 I am the only piercer in the area stocking all the following premium body jewellery brands, as well as a huge range of basic stock – Anatometal, Industrial Strength, Omerica Organic, Flaming Bones, Diablo Organics & Gorilla Glass. 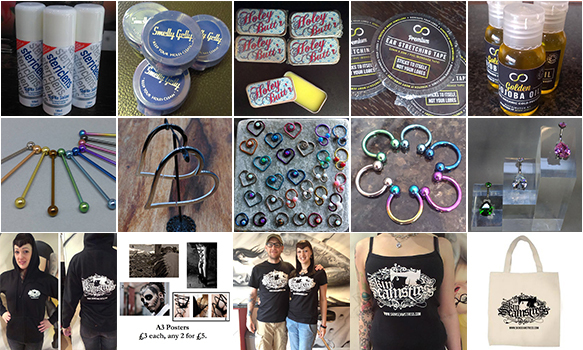 All body jewellery & merchandise available in the studio, or contact me if you would like to mail order anything. Please see my facebook page for up-to-date stock photos.